The fourth annual BCCI Awards ceremony was held yesterday. This whole ceremony was taken place at the Sea side Lawns, Taj Land’s End, Bandra, Mumbai. Sachin Tendulkar was named Indian Cricketer of the Year for 2009-2010 at the BCCI awards. The wives of cricketers took whole attention of the awards. Sachin Tendulkar and former all-rounder Salim Durrani bagged top honours. The World Cup winning Indian team led by skipper Mahendra Singh Dhoni was felicitated by the BCCI . Indian team were felicitated and presented cheques worth Rs two crore each by BCCI president Shashank Manohar and BCCI secretary N Srinivasan. 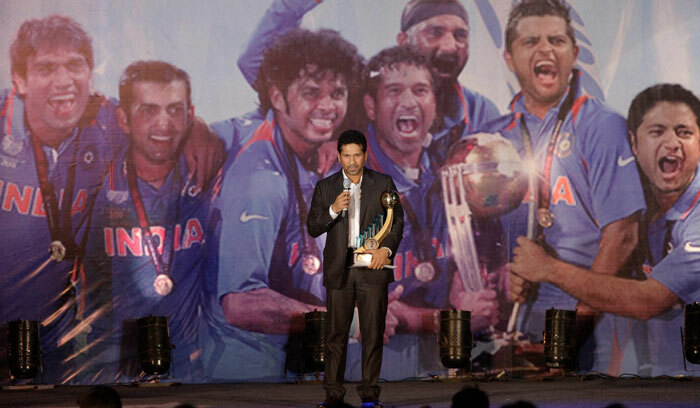 The highlight of the ceremony will be the felicitation of the Indian team that won the ICC Cricket World Cup 2011.